For everything Laos can offer you and your team, its slogan, “Simply Beautiful,” comes across as much too humble. Still relatively untouched by mass tourism, Laos will give you the opportunity to enjoy its natural splendor as an explorer might. From the likes of the amazing Kuang Sy waterfalls to dining on the Mekong Delta, Laos not only shows off its natural beauty, but a deep and storied cultural history, as well. 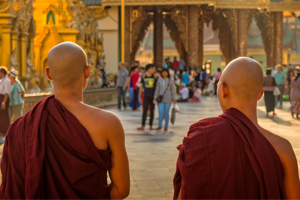 Night markets, a cave full of Buddha statues, and special dancing ceremonies will draw you and you and your travelers into the heart of this vibrant country. 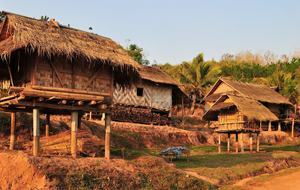 Champassak is a small town situated in southern Laos, almost 40 km to the south of Pakse. Champasak was once, 1400 years ago, the centre of power in the lower Mekong basin, later a revered outpost of the Khmer Angkor empire and later still one of the three kingdoms to rule over the remains of Lane Xang. Vat Phou, the ancient Khmer temple complex, listed as a UNESCO World Heritage site, is the main attraction in the area, but there is much more to be discovered. It is worth staying in the charming town of Champasak where you can discover French colonial buildings, Buddhist temples, or simply enjoy an evening in the Shadow Puppet Theatre. Explore the landmarks, hiking, cycling. 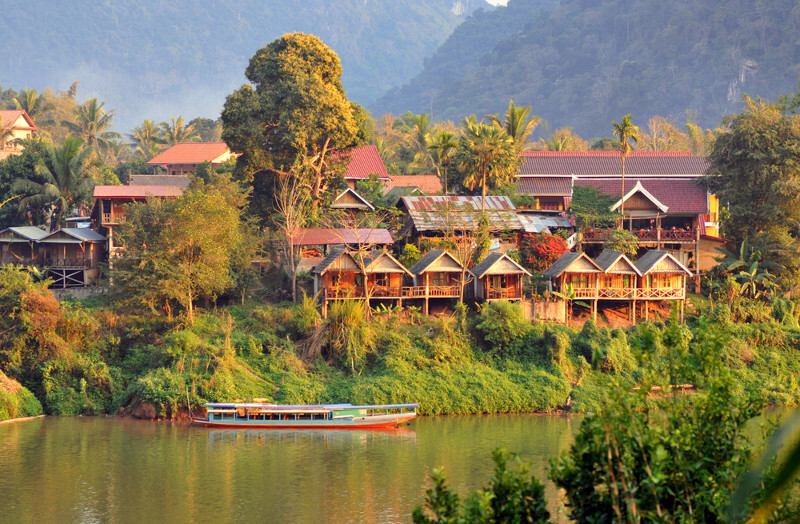 Muang Ngoy is a small riverside village in Northern Laos where it remains a low-key destination in a stunning location. Hidden on a plain beside the river Nam Ou, which is one of the rivers which have the most fish, there are approximately 1000 inhabitants which make it one of the largest villages in the region. Accessible only by river, Muang Ngoi is very much appreciated by visitors looking for tranquility, serenity and peace. Muang La is a small charming town in the heart of northern Laos in Oudomxay Province, With only around 1,000 inhabitants, the village has maintained its local character and culture, and there are also a number of different hill tribe villages dotted throughout the rolling green hills, a wonderful place to learn about Laos’ ethnic minorities, with Akha, Hmong and Ikhos tribe villages located in the surrounding mountains. This area is brimming with natural beauty and charm, ideal for a peaceful holiday. River cruising, trekking, biking, visiting hot springs. 150km up north Luang Prabang on the road # 13, the peaceful village of Nong Khiaw (also called Mouang Ngoi Khoua) has itself Pristine river beauty, dramatic landscape changes, unrivaled karst scenery. This village is about 4000 inhabitants, and developed around the bridge that straddles the Nam Ou River, one of the most historically pure rivers of Laos and home to fish and crayfish reputed in the region. The karst landscapes where the rocky peaks abound are beautiful. 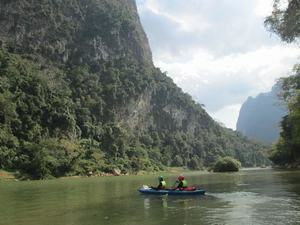 You will find a relatively unspoiled nature, waterfalls, and a river Nam Ou where fishing is obviously practiced, and a great place to experiment kayaking. Luang Prabang is the ancient, capital city of the Lane Xang Kingdom. 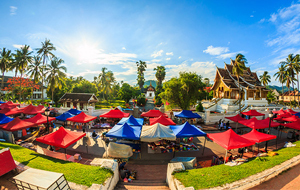 In recognition of the city’s vast array of Lao monuments, countless monasteries, and its historic and cultural significance, UNESCO declared all of Luang Prabang a World Heritage Site in 1995. The city itself is located at the meeting point of the Khan and Mekong Rivers and is surrounded by deep green hills and waterfalls. The view over dozens of temple rooftops from the hill in the center of town, at sunset, will undoubtedly be an unforgettable memory of Southeast Asia. Moreover, Luang Prabang provides many opportunities for unique cultural experiences, as well as adventure for all levels of explorers, all nestled in a picturesque landscape of mountains and lush forest. 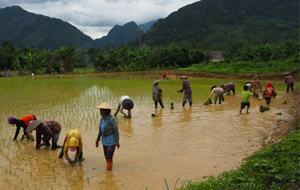 Located in the northern part of Laos, Luang Namtha shares borders with Myanmar and China. The province is mountainous and home to several ethnic minorities, giving travelers great trekking and cultural contact opportunities. 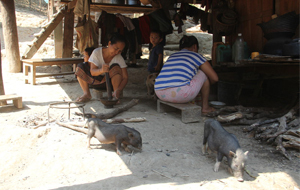 The various ethnic groups – Khamu, Akha, Hmong, and Yao (Mien), Tai Lue, Thai Neua and Thai Dam – tend to live in villages just outside the protected areas and the historic town of Muang Sing. 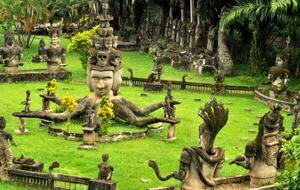 Luang Namtha also boasts picturesque and numerous ancient temples. 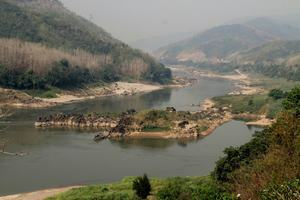 The former French administrative outpost of the Champasak province is located right at the meeting point of the Mekong and the Sedon Rivers. From Pakse, you can travel through the lush, fertile Boloven Plateau and discover the cultivation of rice, coffee, cardamom, and bananas, as well as several spectacular waterfalls, including the 120-meter-high Tat Phan cascade. 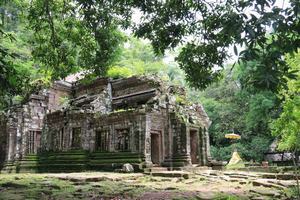 Travel another 46 kilometers south of Pakse to visit Vat Phou, one of the most important sights in Laos. Literally meaning “Mountain Temple,” Vat Phou is a multi-level structure built along the slope of the adjacent mountain, dating back to the Angkor period from the 9th to 13th century CE. The upper platform of the temple affords a wonderful view of the Mekong plains – one that simply shouldn’t be missed. Located in the northeastern region of the Champasak Province in southern Laos, the Bolaven Plateau has an impressive altitude ranging from 3380 and 4430 feet. Its name refers to the Lavaens ethnic group, who used to inhabit the region. 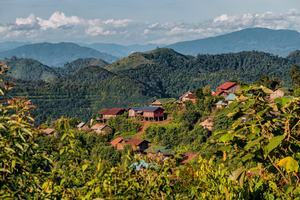 Nowadays, the Plateau welcomes many ethnic communities, such the Alak and Tahoyor Suay. Enjoying a temperate climate and very fertile soil, the Plateau is renowned for its tea and coffee plantations; the latter produces coffee that’s considered one of the finest types worldwide. The capital city of Laos, with 750,000 inhabitants, Vientiane is located on the left bank of the Mekong River, which marks the border with Thailand. 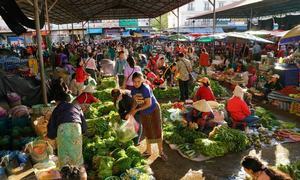 Often considered the ‘largest village in Asia,’ Vientiane is, in fact, not a major touristic site. Its attractions are mostly Buddhist monasteries and a few monuments from the French colonial era, such as the famous Patuxai, popularly called Vientiane’s “Arc de Triomphe”. 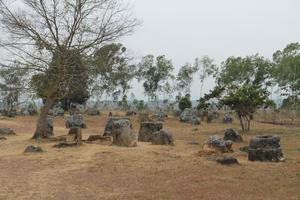 Located in northern Laos, the province of Xieng Khouang is host to beautiful landscapes of lush, green mountains and karst limestone, but the main attraction in Xieng Khouang is doubtlessly the jaw-dropping Plain of Jars. Stone jars of various sizes, mysterious and apparently carved out of solid rocks, are scattered all over the plateau, with the biggest one reaching a staggering height of 3.25 meters. Researchers have long speculated as to the function of the stone jars, which are estimated to be 2,500 to 3,000 years old, but debate still rages to this day, making it all the more mystical to wander among the jars of giants. 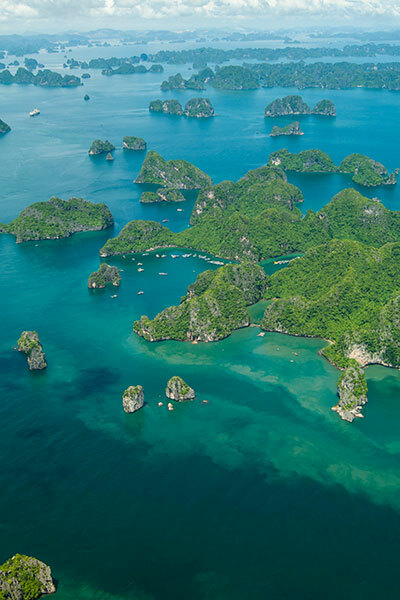 Located at the country’s southernmost point, the Si Phan Done region – literally “the region of the four thousand islands” – is a series of islets on the Mekong River. The river indeed spreads over more than 14 kilometers in width at this point, forming a river archipelago and branches, before flowing into the Khon Phaphenga Falls at the Cambodian border. Two islands -Khong Island and Don Khon Island -enjoy greater notoriety, due to their size and the hotel offerings exclusively centered there. The entire region also offers magnificent landscapes to be discovered aboard a local wooden boat or on a trek over the Khong Island. 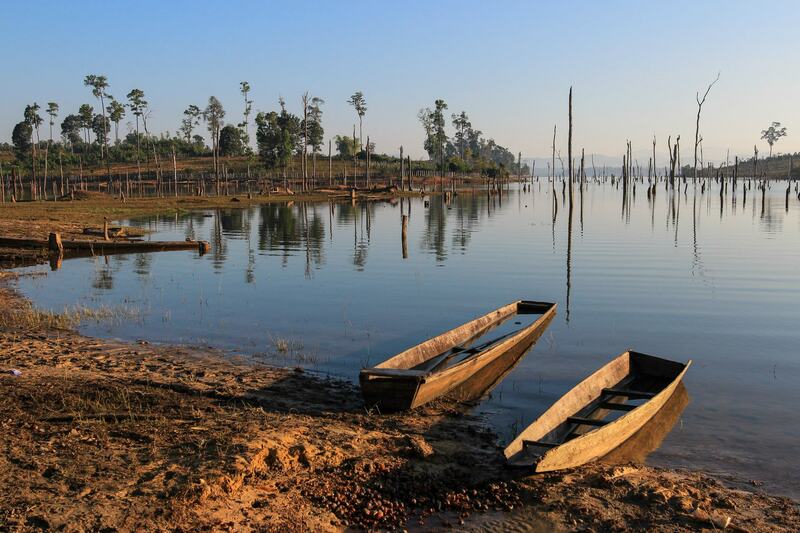 This region is even home to freshwater dolphins, which will certainly add a touch of exoticism and whimsy to your trip. Still almost entirely unknown to tourism 10 years ago, this small, traditional village, nestled on the left bank of the Mekong River, has become a wildly popular destination. Halfway between Huay Xai (located on the Northern border with Thailand) and Luang Prabang, Pakbeng offers travelers on river cruises the opportunity of spending a night on the banks of the mythical Mekong River. The town is currently being connected to Oudomxay by road, making it easier than ever to explore this extreme, northern region of Laos, where many ethnic communities live. Capital city of the Khammouane province, Thakhek is located in south-central Laos, halfway between Vientiane and the Champasak provinces. 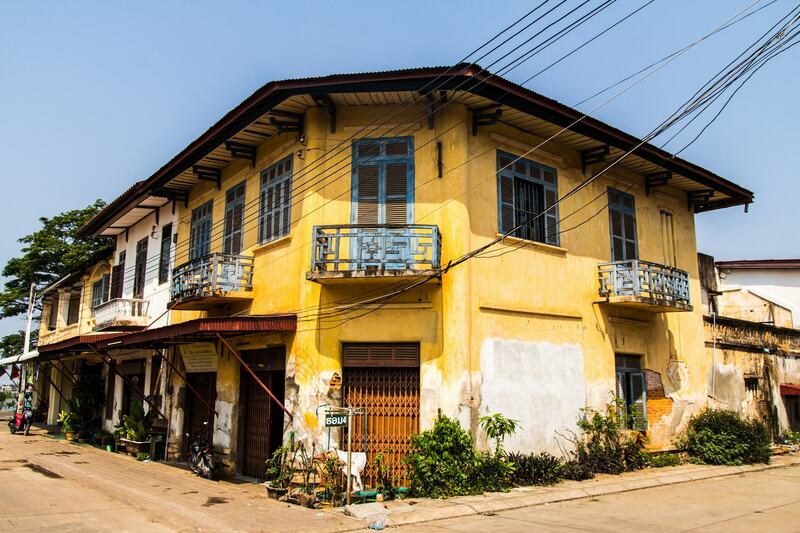 Formerly an important administrative and trading platform under French occupation, Thakhek still boasts the remains of former colonial houses and wide avenues typical of this era, which make it a big draw for architecture and history lovers. 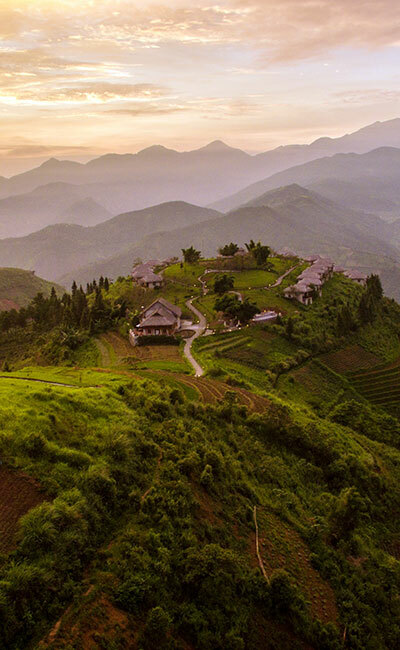 In addition to this, its geographic location makes it a necessary stopover for travelers looking to discover the central-southern region of Laos by land. 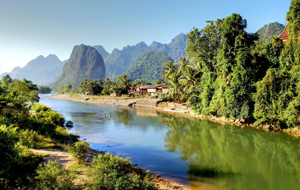 Located on Route 13, between Luang Prabang and Vientiane, and right on the banks of the River Nam Song, the Vang Vieng region and the karstic mountain ranges surrounding it offer splendid landscapes to admire. 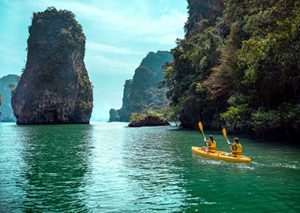 Enjoying a strong potential in terms of adventure tourism (kayaking, rock-climbing, trekking), Vang Vieng is a very popular destination with true ‘backpackers,’ and in the last few years, has become a party destination, renowned across Southeast Asia. The city itself is dotted with bars and other party venues, where alcohol abounds. Vang Vieng is therefore a destination reserved for travelers running between Vientiane and Luang Prabang, and searching for wild and carefree adventure set among beautiful, exotic landscapes. Area : 236 800 km². Official Religion : Buddhism (67 %). Getting a Lao visa is easy and much easier than before. As well as getting a visa for PDR of Laos through usual channels at embassies or consulates, at Embassies or Consulates, travelers of most nations can obtain their Lao visa upon arrival – at the international airports of Vientiane, Luang Prabang, Pakse, Savannakhet as well as at various border crossing points with neighboring countries such as Thailand, Vietnam, Cambodia, and China. Travelers holding passports from the following countries are not eligible for a Laos visa on arrival: Afghanistan, Algeria, Bangladesh, Burundi Cameroon, Congo, Cote d’Ivoire, Ghana, Guinea Bussau, Jordan, Lesotho, Liberia, Libya, Mozambique, Nauru, Niger, Nigeria, Pakistan, Senegal, Sierra Leone, Suriname, Syria, Swaziland Tonga, Turkey, Zambia and Zimbabwe. Passport holders from these countries need to apply for a Laos Visa at the Embassies prior to their visit. Passport holders from Japan, Republic of Korea, Russia, Luxembourg and Switzerland can enter Laos with a visa exemption. Time for delivery: between 10 and 40 minutes depending on the number of people requesting it. Please note that on weekends (Saturday and Sunday) and Laos’ public holidays, $1 is added to the fee. 2. Directly from a Lao embassy abroad before departure. Your passport must be valid for six months beyond the intended stay with at least 1 empty page for visa stamp. International Airport-Laos has 4 international airports. Wattay International Airport in Vientiane Capital has flights to/from Bangkok, Chiang Mai, Ha Noi, Ho Chi Minh City, Vinh, Phnom Penh, Siem Reap, Seoul, Singapore, Kuala Lumpur, Kunming, Guangzhou. Located 5 km outside of the city center. The transfer from the city center to the airport takes around 15 minutes. The airport is currently expanding in order to reach international standard. Luang Prabang International Airport in Luang Prabang has flights to/from Bangkok, Chiang Mai, Ha Noi, Siem Reap, Singapore, Kunming, Guangzhou. The airport has been recently renovated and upgraded to reach international standards. Savanakhet International airport in Savanakhet has flights from Bangkok. Pakse International Airport in Champassak has flights from Bangkok, Ho Chi Minh City and Siem Reap. The airport is small and simply equipped. Domestic airport: there are some popular airports for domestic routes such as Houai Xay, Oudomxay, Luang Namtha, Xieng Khouang, Xayabury where regular flights from Vientiane Capital are operating. Airport service: There are few services at the airport terminal with small restaurants/cafes for food and beverage but with a limited selection. Lao Airlines is the flag carrier of Laos. It has domestic as well as international flights to countries such as Cambodia, China, Thailand, Vietnam, Singapore and Korea.Laos Central Airline is a private company which operates one domestic route Vientiane – Luang Prabang and one international route Vientiane – Bangkok. Vietnam Airlines, Thai Airway, Bangkok Airways, Air Asia, China Eastern Airlines, and Jin Airlines have some international routes from/to Vientiane and Luang Prabang to/from big cities in Asia, e.g. Bangkok, Kuala Lumpur, Kunming, Nanning, Changsha, Changzhou, Guangzhou, Seoul Busan, Hanoi, Ho Chi Minh City, Siem Reap. There is no direct route from Europe to Laos. Baggage allowance on domestic flights with Lao Airlines is limited to 20 kg. Each passenger can carry onboard a free baggage allowance (one piece for Economy class passengers). Each piece has a maximum weight of 7kg and the sum of three dimensions shall not exceed 115 cm (30 cm x 60 cm x 18 cm) or (12 x 24 x 7 inches). Airlines companies may refuse to carry unchecked baggage and may require the passenger to check their baggage if it exceeds the quantity, weight and dimensions as specified above. The domestic airport tax and the international airport tax are included in the air ticket and don’t need to be paid at the airport when checking in. Because of its mountainous topography and the lack of development, the infrastructure in Laos is generally less developed than in neighboring countries but it has some reliable transportation routes which link Northern Laos with Central and Southern Laos. 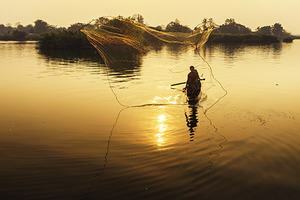 The Mekong and Nam Ou Rivers are the popular natural channels suitable for large-draft boat transportation. 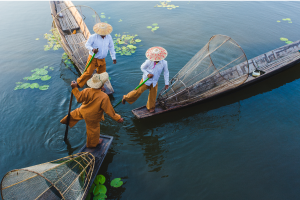 Laotians in lowland villages located on the banks of smaller rivers have traditionally traveled in pirogues for fishing, trading, and visiting up and down the river. As a result of ongoing improvements in the road system which started during the early 1990s, more and more roads are being constructed or renovated to reach the country’s development request and the need of local people. Some local methods of transportation are the tuktuk, Songthew or Samlor (3 wheel motorbike) but there are also many places to rent a bicycle or motorbike. Taxi services are not popular and quite expensive in Laos. Other modes of travel, such as minivan, bus, air and cruise trips, are available for long journeys. Bus 45s: The Hyundai Aero Space is a very reliable bus with all modern comforts and high standards. The 45-seater is the biggest version which is used for up to 36 passengers to ensure maximum comfort. The bus has a high tech air conditioner and the seats are suitable for Western clients. Bus 35s: This type of bus offers great comfort. It can accommodate up to 20 travelers. Most of the buses have electronic devices such as CD Player and microphone. Bus 25s: The two brands for 25-seater buses in Laos are Hyundai and Toyota. The 25-seater bus is a good choice for short and long transfers with a group of maximum 12 people. The bus offers enough space for luggage. Minivans of 09s are mostly produced in South Korea, the Hyundai Starex is the most popular car used for individual guests in Laos. This 9-seater van is suitable for 01 to 04 people with a guide and driver. Minivan of 15s: this is a 15-seater Toyota Hiace mini-van which is very common in Laos. It is suitable for 05 to 07 travelers with luggage (maximum 9 pax. without luggage). It can be used for either short unpaved tours or long distance tours with good road. A cruise trip on the Mekong River from Houai Xay to Luang Prabang via Pakbeng (02D/01N) (03D/02N upon request) is a popular route for travelers. There are different choices for your budget, from local cruise to luxury one. 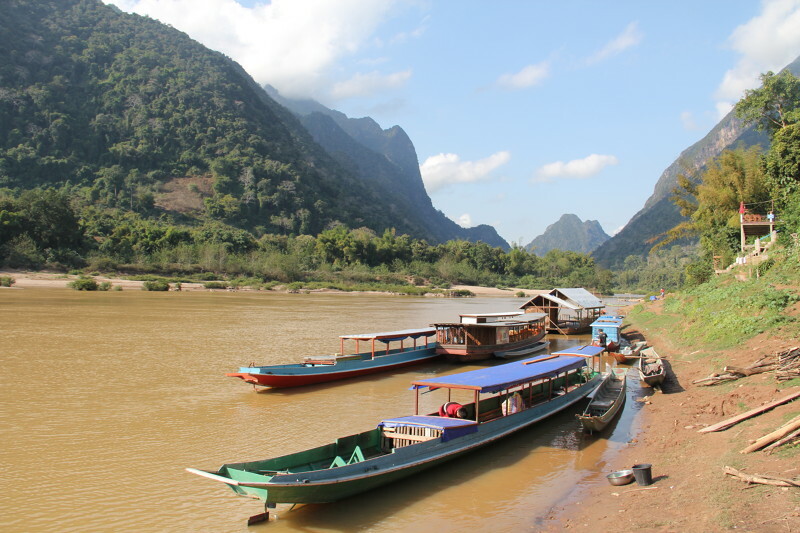 Other short trips by local boat are: boat on Nam Ou river (from Muang Khua to Muang Ngoi or Nongkhiaw), boat on Nam Song river (in Vang Vieng), boat from Don Khong to Don Khone (in 4000 island area)… These are also very popular and highly appreciated. Mekong Pearl: operates cruise trips from Vientiane to the Golden Triangle, passing through Luang Prabang town. Vat Phou cruise operates a 03D/02N trip in the southern part from Pakse to the 4000 island area. You can contact your tour operator to get further information on departure times and tour details. Tuktuk: TukTuk is one of the most popular means of transportation in Laos. This is also a tourist’s favorite way to discover the city or for a short transfer. When visiting Laos, there are some customs and beliefs that travelers should be aware of before coming to the country in order to avoid offending any of the locals. The Lao word for “hello” is “Sabai dee”, say it with a smile and you will be well received. The head is considered high. It is not acceptable to touch Lao people’s heads, so bear that in mind. Dress neatly, keep quiet and take photos without flash and not too close when you observe the monks’ alms giving in the early morning. Dress neatly when visiting religious shrines or temples. At some temples, women in pants or short skirts are required to put on a Lao skirt (Sinh) as another layer before entering the place. Lao skirts are usually provided or available for rent on spot (if this is required). Don’t hesitate to take photos of local people but you should ask them for permission or give them a smile before doing it. Personal cleanliness is valued highly in Laos. Anyone who has strong body odor tends to get disgusting looks. In a Lao gathering, keep a low profile and you will maximize your chances of social success in Laos. 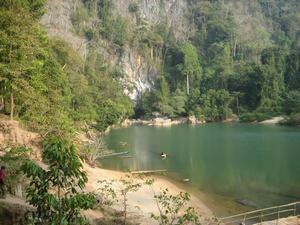 Most Lao people swim in rivers or waterfalls with at least shorts and a T-shirt. It is more polite to do this rather than walk around in swimsuits or bikinis. Also, if you are in the country and have to bathe in the river in the evening, women should wear a sarong. You might find it hard to communicate with locals if you don’t speak Lao especially in the countryside where people sometimes speak in their Ethnic language and not often speak English. If things don’t quite work the way you expect, remember to keep your cool, don’t lose your temper or raise your voice. It won’t help you, it will only make you look bad. Learn some basic Lao phrases and practice them with the locals you meet, they will be impressed and you will be well received. Laos’ currency is called KIP, pronounced “kip”. Bills that represent Kip are broken down into 500; 1000; 2000; 5000; 10 000; 20 000; 50 000 and 100 000 KIP denominations. Please be aware that the KIP is a non-convertible currency and cannot officially be exchanged abroad. The official exchange rate in Laos is around 8,512.70 Laotian Kip for USD 1 (January 2019). Foreign currencies such as US Dollars, Euros, Thai Baht, Australia Dollars are popularly accepted in Laos to be exchanged into KIP and tourists are entitled to exchange easily money at the current market rate at the banks, airport or at any licensed money changer. The presentation of your passport is sometimes requested. Please ask your tour guide for assistance in case you need. It is advised to bring new and undamaged bills. Exchange places and banks recently started to charge 15-30% to deal with damaged/old/stamped bills. Also, exchange rates can vary depending on your denomination. The network of ATM machines covers the most visited cities in Laos by tourists and business travelers. The maximum amount per withdrawal is 1,500,000/time and maximum 7,000,000/day. The ATMs can charge a fee of 25 000 KIP (subject to change) or equivalent for each transaction. Some visa cards are restricted by the issuing bank for overseas use and therefore, customers may require seeking the approval of the issuing bank in order to do so. Credit Cards are widely accepted by local suppliers in big cities (such as Luang Prabang and Vientiane), usually high-end hotels or shops, however they usually entail a 2.5-3% surcharge. In others, the use of cash is more popular and recommended. Traveler checks are rarely accepted by local suppliers so we do not recommend you to use it in Laos. In Laos, you are expected to bargain. Do so freely but respectfully. Keep a smile on your face, be realistic about the expected discount and if the vendor does not reach your final price do not push him or her too hard. Tipping was unknown in Laos until tourists started coming to the shores. These days, people such as boat men, drivers, and hotel-restaurant staff have grown accustomed to get a tip from tourists. The same goes for tour guides. Sometimes, when visiting pagodas and monasteries, you might be asked to make a donation. It is up to you whether to do or not. 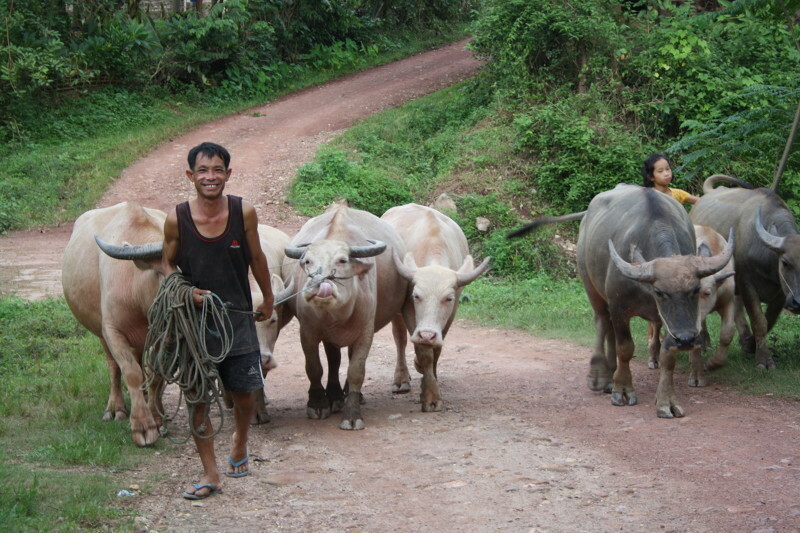 The people of Laos are usually generous to the extent their finances allow. The amount depends on you but it might be around 10, 000 – 20, 000 KIP. About $5-$7 per day per person for a national guide. Drivers (car and boat): $2 per person per day is average. Porters: 10,000 KIP per bag person/per day is sufficient. If you travel to Laos, make sure that all of your vaccinations are up to date and that you are vaccinated for Tetanus, Polio and Diphtheria. Other vaccines recommended include Hepatitis A and Hepatitis B (if you are in-country for over 3 months), Typhus and Tuberculosis, vaccinations against rabies and Japanese encephalitis are also advised. Officially there are no vaccinations required to enter Laos. Drink a lot of water during the day (2 liters). Do not drink tap water in Laos. Only bottled water is drinkable. The most popular brands are Tiger Head and Dao. Most important: Trust your gut feeling. If you don’t like your food, stop eating and do a double take when eating from street vendors. Make sure your passport is valid with at least 6 months before the expiry date and that you have the correct visas. Have a look at the visa requirements for more information. Consider medical, baggage and trip cancellation insurances. Check with your doctor regarding re-vaccinations and medicines needed. Shirts should be long sleeved and light weight with lots of closed pockets. Cool evenings during November – February, so pullovers or a light weight jacket are recommended. A light weight vest with lots of pockets will be handy for carrying your film camera and binoculars. Bathing suit should be modest so it does not offend the locals. Hat for sun protection. Should have a wide brim and a strap. A sturdy poncho or parka will help to keep you gear dry in case of rain or waterfall spray. Footwear: You will need some sturdy comfortable boots for trekking or just walking around. They will need to support your ankle as well as having a non-slip sole. Waterproof sandals for those short trips and boating. Some smart casual clothes for the evenings and restaurants. From December to January or in the hill stations, Bolaven highlands or on a boat trip from Houai Xay to Luang Prabang, the temperature can be quite chilly so bring a sweater or other warm clothes. Visitors should not wear shorts, short skirts or other skimpy clothing when visiting pagodas and monasteries. The Elephant Festival is a celebration of cultural and traditional ties between Lao communities and elephants, as well as a way to raise awareness of their endangered status. The Elephant Festival is a free, all-ages event with incredible activities like a majestic elephant procession, attended by up to 100 elephants, a traditional elephant Baci ceremony, vibrant fruit and flower offerings, monks’ blessings, mahout (guardian) and elephant shows, live performances from local Lao and foreign artists, a night market, and even an outdoor elephant museum. Wat Phou Champasack is the most famous Hindu temple complex built in Laos under the Khmer Empire, which dominated much of Southeast Asia throughout the 10th-14th centuries. 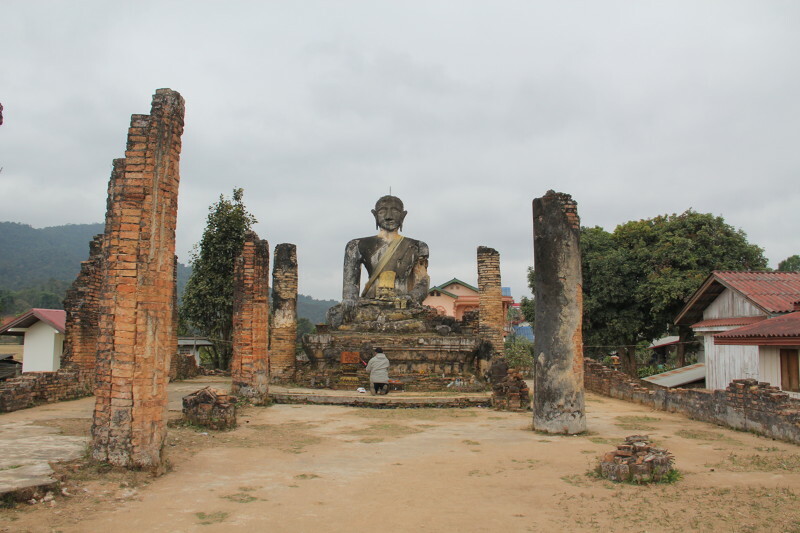 Five years ago, Wat Phou was certified as a UNESCO World Heritage Site. In recent years, with the help of many international organizations and neighboring countries, the complex has enjoyed nearly constant renovation and preservation, aimed at keeping what is left of the existing structure from collapsing. Pi Mai Lao, held during the Lao New Year, is one of the most important dates in the Lao calendar. 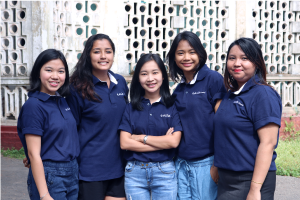 As well as being a truly joyous time, Pimai Lao has become synonymous with the celebration of Lao identity, of family bonds, and an opportunity to reflect on the year ahead. April 13th, the last day of the year, is a day of renewal, symbolized by water. Buddha images are washed, and both temples and homes are tidied. The young pour water on their elders’ hands, asking for blessings in the coming year. In Luang Prabang, the Boun Suang Heua, “Boat Racing Festival,” is held in August on Khao Padapdin. 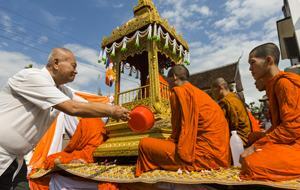 In Vientiane, boats head out just after ‘Buddhist Lent’ ends. Traditional racing boats are carved from a single tree, can hold up to 50 rowers, and are only rowed annually for the race. Several days before the race, the boats are cleaned and presented with offerings, since the boats are considered sacred. Lhai Heua Fai (“Festival of Light”) is celebrated at the end of Lent all over Laos, especially in riverside towns. Vientiane’s festival attracts many devotees and tourists alike, but the celebration in Luang Prabang is even more spectacular. Families fashion small, round, banana leaf containers on a section of banana trunk. In this container, they put incense sticks, betel nuts, and sometimes food or money. At the riverbank, with candles and prayers, they send off the light boat. The spectacle of thousands of twinkling candles on the Mekong River is truly moving. The That Luang religious festival lasts three days, starting with the wax castle procession at Wat Si Meuang and ending with a procession around That Luang, “The Grand Stupa”, in Vientiane: sanctuary to the Lord Buddah’s hair and bosom bone. Thousands of monks and tens of thousands of pilgrims come from all over the country – and even from Thailand, Cambodia and Vietnam – to attend the festival. On the next day, a more elaborate procession brings more wax castles through the Eastern Gate of the That Luang cloister, carried three times around the Grand Stupa, and offered to the shrine. As December comes to Laos, the former royal capital transforms into a theater. Screens are rigged on garden lawns, within the walls of five-star hotels, and at central markets. The whole town, now dotted with movie screens, then becomes the perfect setting for celebrating the art of cinema. LPFF believes in equal access to art, so all screenings are open to the public and completely free of charge. At the main outdoor venue, they set up 800 blue chairs, but regularly welcome eager audiences of over 1,000 people per screening. The H’mong New Year celebration features incredible, vibrant displays of traditional costumes made from green, red, and white silk, adorned with ornate silver jewelry. Music from traditional H’mong instruments, such as the teun-flute, the H’mong style khene pipe, and even leaf blowing all lend a beautiful atmosphere to this feast for the senses. Other festivities include the Makkhon (cotton-ball) throwing ceremony, ox fighting, spinning-top races, and crossbow demonstrations. My most memorable trip was in Meungngoi, northern of Luang Prabang for hiking in the mountain and see the minority people, stay with them exchange the local life which made me very excited on their welcoming. My next trip will be Myanmar, to see this wonderful country. When I have free time I love to do cooking, think about the new different food to cook and test! My name is Matt. 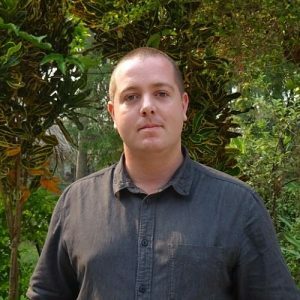 I am 27 years old and I am the Production Executive for Easia Travel in Laos. I was born in England, but I moved to Southern Spain when I was 10 years old. I lived in the Alicante region for the next 12 years – it was here where I discovered my passion for extreme sports. I have always loved travelling and discovering new places, especially those where I can feel free and in touch with nature. I graduated from the University of Saint Andrews in Scotland before making the move to Asia shortly after and I have been here, in Laos, for the past three years. 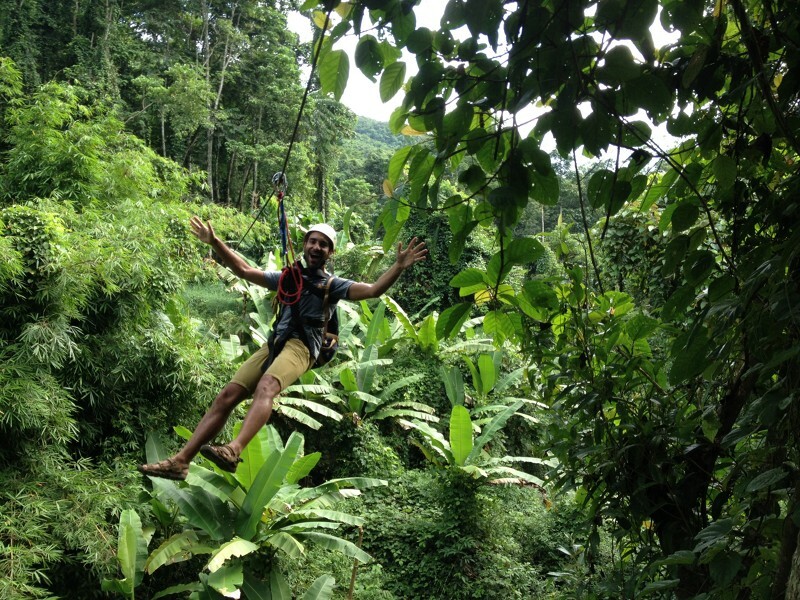 In my free time I enjoy a variety of adventure sports – slack lining (it’s like tight-rope walking), rock climbing, hiking, mountaineering, and mountain biking. Sky-diving is also something else that I enjoy, but I don’t get to do much of that at the moment! Playing the guitar (or at least trying to…) and trying new exotic foods (not too spicy please!) are also other things that I enjoy.